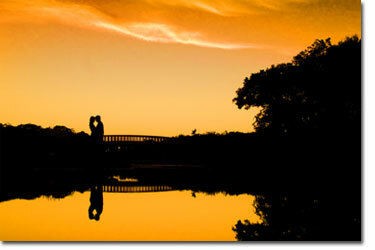 Silhouettes are fun - whether the session is an engagement session or wedding session. Many might not know that the following two photos were taken within a few seconds of each other. Same couple. Same setting. Same lighting. The difference: the camera exposure setting. A camera can only capture a narrow spectrum of the visible light. While our eyes can see a much greater range of detail from light to dark, the camera has to select a certain portion of that range and focus on it: everything brighter becomes pure white and darker becomes black. To capture a silhouette: set your camera exposure to properly exposure the bright sky (and yes, this can even be done with a smartphone!). When the camera looks at the bright sky it will darken the overall exposure, leaving you with a silhouette. This typically involves getting down lower and photographing up towards the couple and the sky. In the silhouette image above I was across a little pond from the couple. I was down as near as I could get to the water, which still wasn't low enough. So I held the camera down just above the surface of the water and fired away. While I wasn't able to see through the viewfinder, every few shots I would look at the LCD to make sure I was properly framing the couple and scene. When I opened the image in Photoshop I darkened up the shadow areas and adjusted the color in the sky. If you are not sure how to set your camera to meter and exposure for a certain part of an image you will need to get your camera's instruction manual out and do some reading. On many DSLR's you'll want to point your camera at the sky, hit the "auto-exposure lock" button, then recompose and take the picture. With a point and shoot camera you may see if the camera has a silhouette mode you can use, or you could try manually adjusting (to darken) the exposure. Even smartphones can often adjust (darker or lighter) an exposure.